This film-creating, breathable aluminium spray disinfects surgical wounds and leaves an elastic metal film that protects against bacterial contamination and other environmental influences. 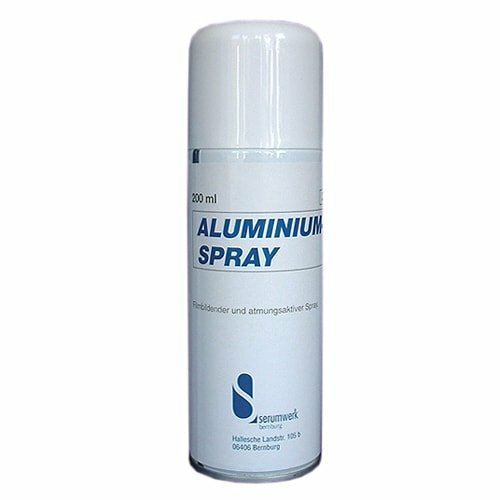 The aluminium spray is used on wild and zoo animals that are difficult to bandage. For grazing animals, the aluminium spray by Serumwerk Bernburg protects the wound from the wet and dirt. Aluminium spray can generally be used to protect wounds on all mammals. Aluminium spray is used in particular on animals that would not accept bandages, such as zoo animals or wild cats after castration.